Freestyle Kayak Moves is a new and easy to follow DVD which demonstrates how to perform a wide range of moves – from a simple Spin to a complex Helix. 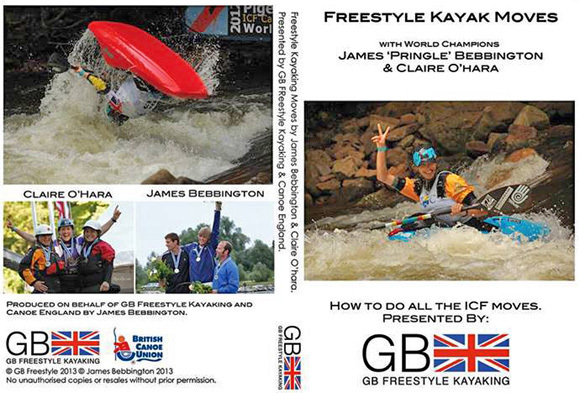 The DVD covers all the currently recognised moves on the International Canoe Federation’s (ICF) score sheet. Freestyle moves are demonstrated and described by the UK’s World Champions James ‘Pringle’ Bebbington and Claire O’Hara – who add their own tips for successfully nailing the 20 ICF moves. Each move receives a short, technical description before James and Claire cover the dynamics in more detail, with plenty of video to allow the viewer to really grasp the fundamentals of each move. At £12.00 the DVD offers good value for money for those who are working on their freestyle moves – whether you are a beginner or someone looking to extend your repertoire into more complex and challenging moves. The competition will close at midnight on 30th September 2013 and the winner will be announced in the first week of October at www.canoelondon.com. * Canoe London may contact you from time to time with news regarding kayaking and canoeing in London. You can opt out of these messages at any time. Only one entry per person.